Measuring the impact of automation is a critical starting point for a community or company. Determining the potential job and wage losses and gains in a region matters obviously to the community’s economic development and political leadership. It matters as well to company’s considering locating in a region—they need to understand the economic vitality of the marketplace but also the economic opportunity in targeted industries. The Montrose Group, LLC developed the Montrose Automation Index to measure the job and wage impact of automation. The Montrose Automation Index is relatively simply- a region’s occupations are research from federal government, U.S. Department of Labor, sources to determine the number of these occupations and the wages they pay. Those region’s occupations are then compared to the over 600 occupations that Professors Carl Benedikt Frey, and and Michael A. Osborne of Oxford University’s outlined in their landmark study, The Future of Employment: How Susceptible are Jobs to Computerisation?, September 17, 2013. Unless checked through economic development strategies and/or market changes, the impact of automation on the Buckeye state could be devasting. As the table below illustrates, larger cities such as Cincinnati, Cleveland and Columbus will see the largest wage loss—although they by far have the largest total wage pot. Columbus and engineer heavy Dayton will fair the best under this analysis while Youngstown will be impacted the worst with a 40% wage loss from automation. 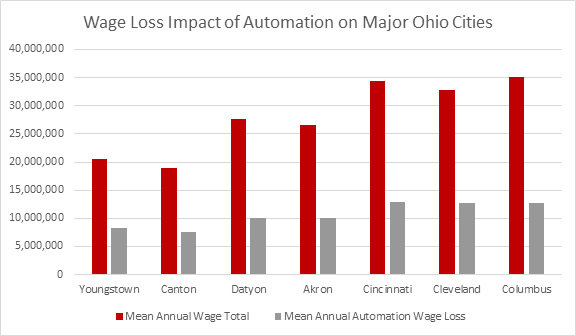 The table below outlines the top ten occupations by wage-loss that will be impacted by automation in Dayton, Ohio. 507 occupations were reviewed in Dayton, Ohio for the impact automation may have. The occupations constituted 356,040 jobs providing a total mean wage wage for Dayton of $27,648,610. Automation, according to the Oxford University study, in Dayton is slated to impact 194,244 jobs and create an annual wage loss of $ 9,972,253 creating a regional wage loss of 36%. The Montrose Automation Index also permits a region to look at which occupations will be impacted and how the region will be impacted by the wage loss from automation. The chart below provides such a list of top jobs that could be lost to automation ranked by the highest paid in the region. As will be discussed later, these high-wage occupations are previously untouched by past automation that are now in jeopardy based upon computer hardware and software developments involving AI and machine learning. When this happens is a matter of prediction. Most analysts see the brunt of the automation impact occurring over the next decade. A couple important notes to discuss the limits of the Montrose Automation Index. It does not and cannot predict how the impact of automation can be limited by economic development and market strategies designed to address this challenge. It also does not measure the impact of a growth in a new industry or increased manufacturing jobs driven by public policy measures or market conditions. Finally, it also does not take into account policy or technology conditions that could slow the implementation of automation. That being said, the Montrose Automation Index should be a wake-up call for all regions and states.